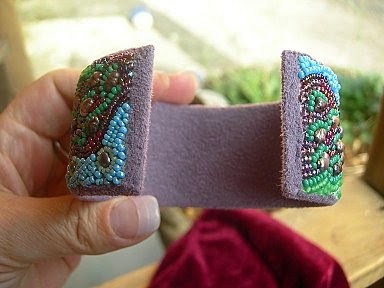 Notes: Bead embroidery with Czech charlottes (size 13-0), true cuts (size 11-0), 14K gold plated true cuts and cabochons made by a local silversmith many years ago. We're not sure if the stones are gaspeite or chrysoprase. 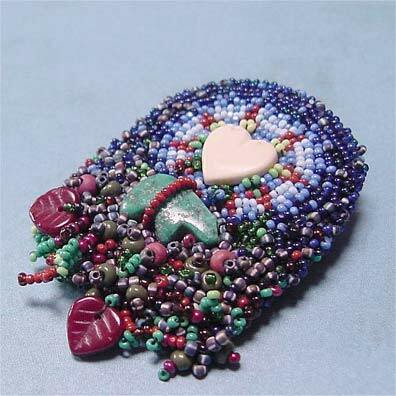 ❧ Bead embroidery with charlottes and other sizes using applique and spot stitch with glass leaf beads. I covered the edges with a solid bead edging of parallel lines. 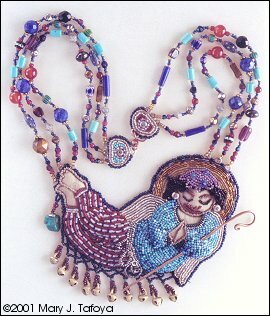 ❧ I talk a lot about how I constructed this piece in my webinar for Interweave Press, Bead Embroidery: Techniques and Inspiration. Notes: I started by gluing the turquoise cabochon onto some bright red Ultrasuede. 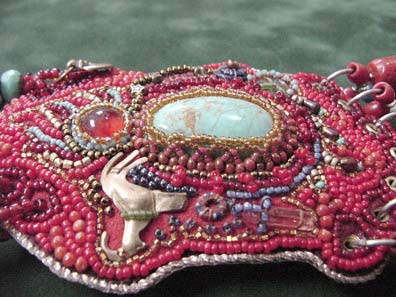 Then I embroidered various gemstones (most of the round red beads are coral for example) and couched a variety of objects to the surface. 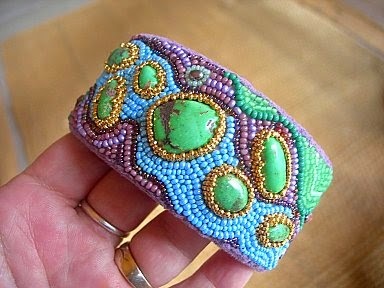 Instead of using a beaded edging, I couched silver metallic cord from India all around the edges. 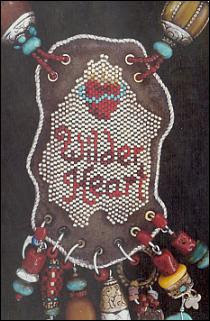 More Notes: I beaded the lettering separately in flat peyote stitch, then sewed the swatch onto the brown Ultrasuede backing, which I faux-aged with brown acrylic paint. 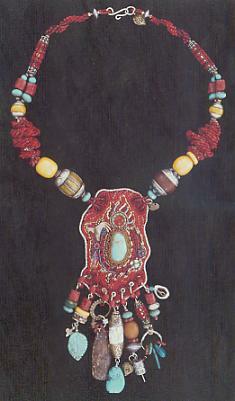 The fringe and necklace strands are attached with rivets. ❧ I talk a lot about durability with mixed media and found objects in my webinar for Interweave Press, Bead Embroidery: Techniques and Inspiration.